Vehicle Fluid Analysis – Armstrong Forensic Laboratory, Inc.
and increase your chance to prevent fraud. Testing vehicle fluids (oil, fuel, transmission and brake fluid) provides information to determine the condition of the vehicle at the time of the fire, flood, or theft. 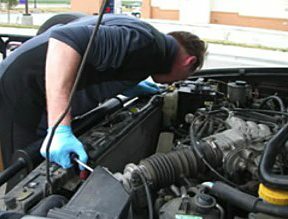 The condition of the fluids and the vehicle can help identify damage, failure, motive, and value. The best answers are real investigations from our 30+ years of experience. A man in North Carolina discovers his vehicle missing. He intends to file a stolen vehicle report and insurance claim on Monday morning. On the Sunday before, his vehicle is discovered. In North Carolina near his home burned. The police suspect the owner. The insurance company suspects the owner. The insurance investigator does a thorough investigation including a sample of the engine oil. The oil analysis indicates massive wear and engine failure. This is an excellent motive for the owner to torch the car. Only, the investigator has in his notes that the oil was changed at a service station the previous week. The service station recorded the mileage at the time of service. The burned, abandoned vehicle had 3000+ additional miles on it. Further investigation and evidence proved the car had been stolen, used in? A multi-state drug run, returned and torched to destroy the evidence. +1 for the Innocent Man 0 for the Bad Guys. Facts make your case. Testing the oil, fuel, transmission fluid, and brake fluid is quick and easy, with no out pocket expense for the investigator. Get the information you need for your thorough investigation. Get all the facts. US DOT Regulations state that samples 2 ounces or less of oil or gasoline must be shipped using an “over pack” mailer. The sample bottle must be placed in a mail piece with enough cushioning material surrounding it to absorb Technically we don’t provide enough absorbent to absorb all of the fluid potential leakage. The cushioning and primary receptacle should be packed within a securely sealed secondary container (mailer) that can then be placed in a box or shipping container. The samples can only be sent via ground shipping and cannot be sent through the air (overnight) or on a carrier that handles passengers. The Armstrong Forensic Laboratory Vehicle Fluid Sampling Kit complies with all DOT shipping requirements.